Our final pitstop for this episode of Pecenongan Fodder is Nasi Uduk Ayam Goreng Sri Rostika. This stall also sells other dishes such as the stir-fried water spinach (Kangkung Cah), Soto, Sayur Asem, Karedok, and grilled seafood like squid, fish and prawn. 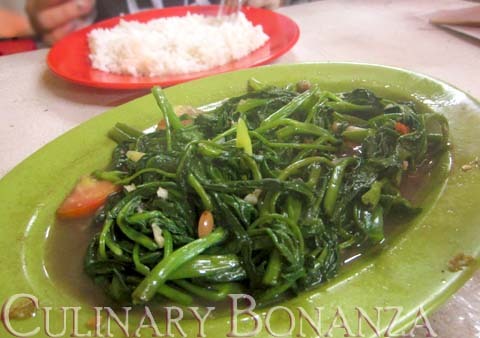 Be warned that whenever the staff cooks Kangkung Cah on the stove, it never fails to emanate particularly choking and sharp fume (must be from the chili and belacan)! I didn't try it, so I can't comment on the taste. 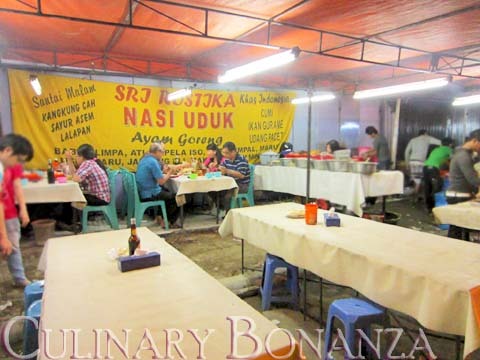 Street food experience in Jakarta such as this in Pecenongan, is nothing like anywhere else. You will be constantly annoyed by the mosquitoes, the noise from the street and cars and motorbikes ploughing through the jam-packed street, and of course, not to forget the "Free" entertainment - the perpetual and persistent street buskers. While eating at any of these stalls, don't be surprised if you are suddenly approached by kids, singing falsely at the clap of their fragile hands or at times, more seasoned adults who come with mobile speaker, even mic and guitar! Some are rather persistent folks. When you choose to just ignore them, they'll stay quite long, either to wait for you to open your wallets or simply to annoy the hell out of you, so you'll give your money to shoo them away. And of course, Jakarta is not Jakarta without the rampant sights of vagrants on the streets. On the 2 nights I came to Pecenongan, I crossed paths with the same pair of an old disabled woman sitting on a self-made wooden cart and 1 person who pushes her around from stalls to stalls. Am I heartless if I feel no inclination to make any donations? *) No Tax & Service Charges. No tip is expected. Pay when you leave and where you ordered. 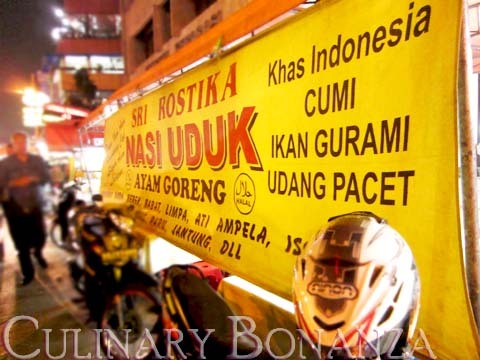 If you want to try better one still around that area, I'll recommend "Nasi Uduk Kota Intan" (or have you tried that already?) at Samanhudi/Krekot, right beside Sop Kaki & Sate Kambing Krekot cabang Krekot, in front of GKI church. My all time favorite! :D (Their sambal itself could drive me 'sakaw' hehe). They even have 2 stalls for themselves. 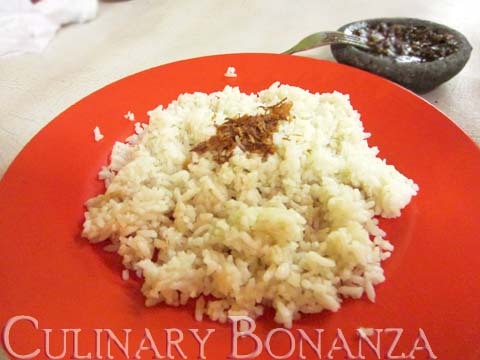 All Karang Anyar, Krekot, Pecenongan, Pasar Baru (and around) residents must know its fame.